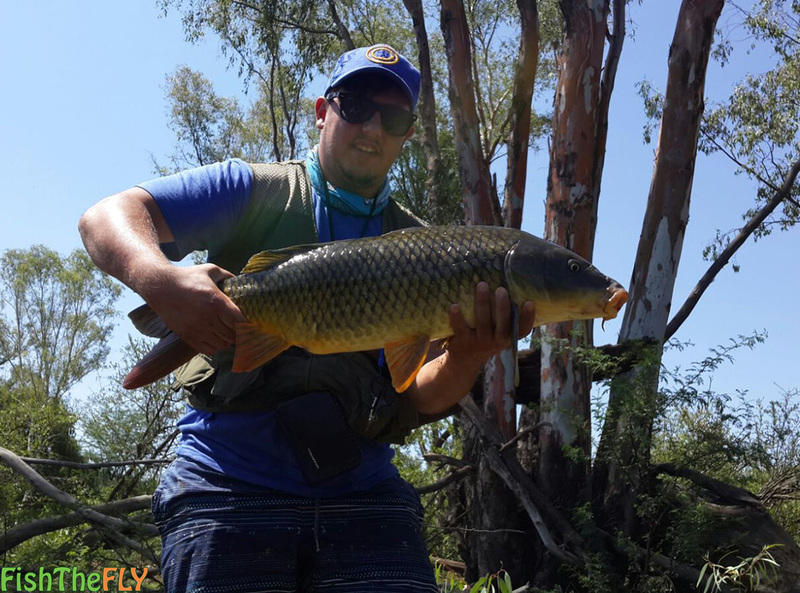 Catching Carp on fly is becoming extremely popular in South Africa, and many anglers are actively seeking out Carp as a target species. The Carp is a freshwater fish species that was introduced into South Africa in the 1700’s and 1800’s as an aquaculture and fishing species. There are 4 main species of Carp that occur in South Africa: The Common Carp (Fullscale Carp), Mirror Carp (With scattered shiny scales), Leather Carp (Without scales) and then the Koi (Of which there are 100’s of sub species). 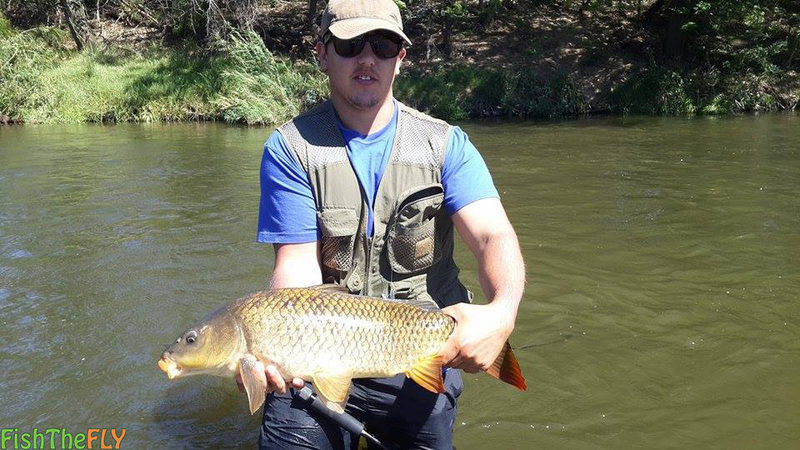 All these species fall under the Common Carp (Karp in Afrikaans), which has the scientific name of Cyprinus carpio. 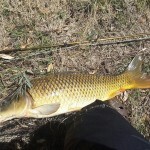 There are also Carp species such as the Silver (Asian) Carp and the Grass Carp. The image you see here is from Scott Bester. 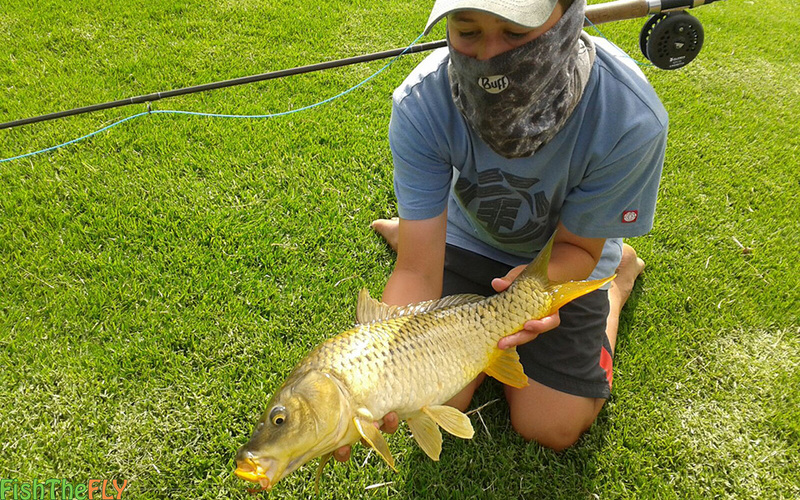 This beautiful Common Carp was caught on a public dam in the Eastern Cape on an Aggravator Nymph. The key to catching Carp successfully on fly is seeing them… Never forget that. We will discuss it further down the page in the how to catch carp on fly section. The Common Carp can reach weights of close to 50 kilograms around the World, and fish of 25 kilograms and more are becoming plentiful all around South Africa. 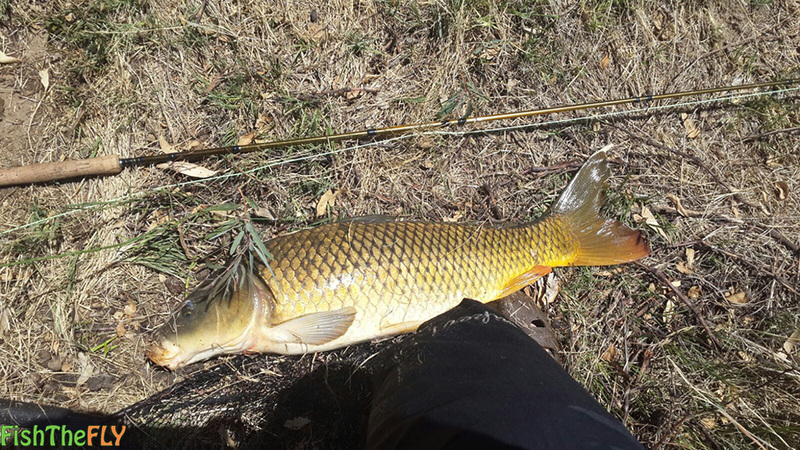 If you catch a 10 kilogram Carp on fly, you will know all about it. 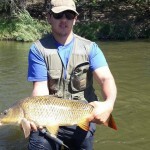 These fish are a fine sport on fly tackle.. Carp can be found all over South Africa, but they do prefer areas that get warmer in Summer, thus they are absent from most mountainous regions in the Country. There are many dams and rivers where Carp can be successfully targeted on fly. 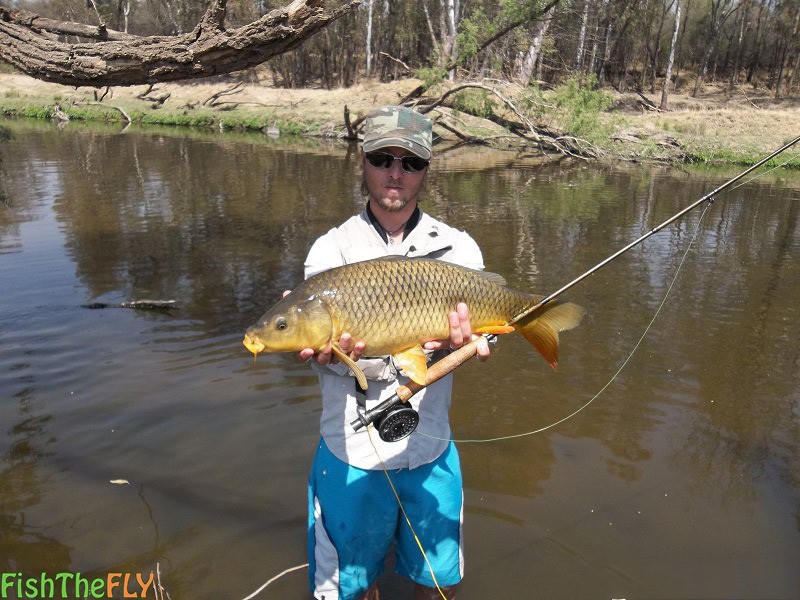 Any body of water that holds Carp gives you an opportunity to present a fly to them. And if this is done in the right way, you are certain to catch this highly adaptable fish species. Carp do tend to prefer large bodies of water and slow runs in rivers. Areas with soft bottoms are what Carp favour the most. They can live almost anywhere that they are introduced to, and thrive in the conditions presented to them. They breed during Spring and Summer and lay their sticky eggs in submerged vegetation after spawning in the shallows. The Carp grows very quickly and the eggs usually hatch within 10 days or so. How To Fly Fish For Carp On Fly? The Fish The Fly team has come up with some great techniques and tricks to help you catch Carp on fly. 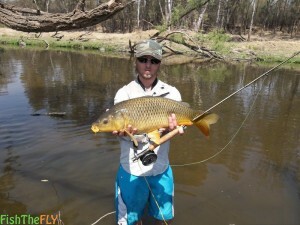 Fish the Fly team member, Jason Macintosh, has given us some insights into how he catches Carp on fly. The key to targeting Carp on fly is using your sight. You need to look for the Carp, they like deeper slow moving pools, shallow areas, and areas with overhanging trees. You can often see them “finning” or “tailing” which indicates their presence. Otherwise you can look for groups of bubbles, this indicates that Carp are feeding on the bottom, and it is a good place to start looking for them. 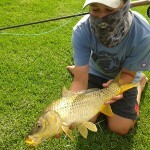 You occasionally catch Carp in the rapids and faster flowing waters while targeting Yellowfish. Your best bet is to walk and find the Carp. Be careful when you walk as they can spook very easily. If you are targeting Carp specifically on fly, we would recommend using a 6 – 9 weight rod and reel, with floating line and a tippet of at least 8-10lbs. Tapered leaders also help, as they absorb the shock on the fast runs the Carp tend to go on. A 6 weight is ideal for targeting Yellowfish and Carp at the same time, but you do need a bit of pulling power if you are looking for those monster 10 kilogram plus fish. So a 7 or even 8 weight is a good setup. Method 1: Locate the Carp in the shallows or where you see them feeding as mentioned above. 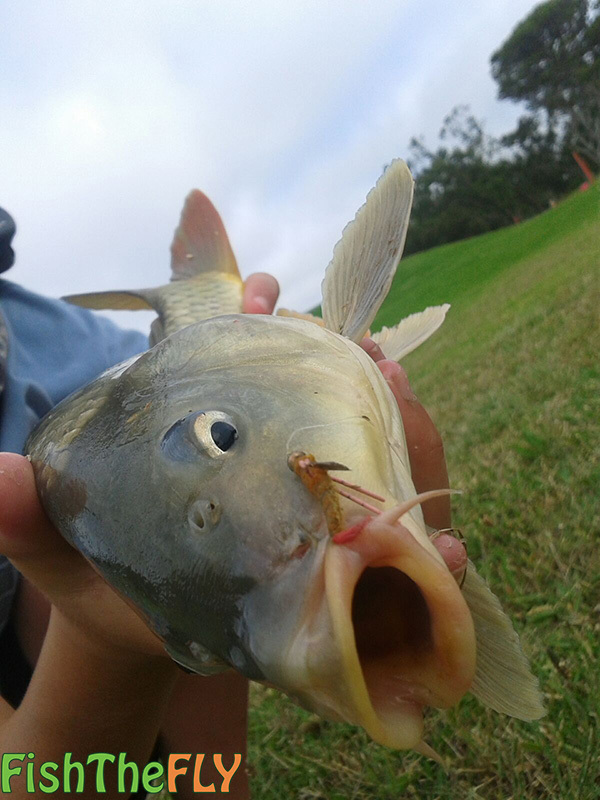 Use a Carp Fritz (Or similar fly – needs to have a black “buggy” body and a red tail, with dung-bell eyes) and cast your fly in front of the feeding fish. If the water is clear enough or if you don’t need one then do not use a strike indicator. If you feel more comfortable using a strike indicator, use one about 50 centimeters from your fly. Watch your leader or indicator for the take, and strike! Method 2: This method allows you to target other fish species as well. Use your Carp Fritz (Or similar fly – this time with a pink or orange bead opposed to dung bell eyes) as a third fly. Let me explain. Use a normal 2 fly nymph method, use a Mustard Caddis (Control fly) and a small GRHE as the point fly. Above the control fly add two split shots, about 10 centimeters apart. Now in-between the split shot tie a piece of leader, about one quarter of the length of your actual leader. Tie your Carp Fritz onto this. This method can be used in rapids and pools and when you are fishing blind. Some more Carp on fly! The best flies for targeting Carp on fly on can be seen listed below, obviously these are not all the flies, but they are some good ones to start you off with. You can also read our article “The 5 best flies for targeting Carp“.